Chinese President Xi Jinping on Sunday made a four-point proposal on further advancing women's rights worldwide while addressing a high-level summit at the United Nations (UN) headquarters. Speaking at the Global Leaders' Meeting on Gender Equality and Women's Empowerment, Xi said the pursuit of gender equality is "a great cause," for "a review of history shows that without women's liberation and progress, the liberation and progress of mankind would not be attainable." "On the occasion of the 70th anniversary of the founding of the United Nations and the 20th anniversary of the Fourth World Conference on Women in Beijing, it is of great significance for us to convene this Global Leaders' Meeting to reaffirm our commitment to gender equality and women's development and make plans for a better future," he said. The president put forward a four-point proposal on promoting gender equality and women's all-round development worldwide. "First, we should strive for women's development in tandem with social and economic progress," Xi said, pointing to the need for "more well-rounded development strategies" and updated policies to stimulate women's potential, raise their participation and ensure their equal share in social and economic development. Second, countries should protect women's rights and interests, which are basic human rights and must be protected by laws and regulations and integrated into national and social rules and norms, said the president. "We must build up women's capacity of playing their part in the society and economy, involve women in higher levels of decision making and support them in becoming leaders in political, business and academic fields," Xi said. Countries must ensure sufficient basic medical services for women, ensure that school is affordable and safe for every girl, and develop vocational and life-long education for women to help them better adapt to changes in society and the job market, he said. The president also proposed to make joint efforts to build harmonious and inclusive societies, as "a society with less discrimination or prejudice against women is often more inclusive and dynamic." "We must eradicate all forms of violence against women, including domestic violence. We should focus on gender equality and dismiss outdated mentalities and customs inhibiting women's development," Xi said, adding that he appreciates UN Secretary-General Ban Ki-moon's "He for She" Initiative and hopes more men will join in the action. 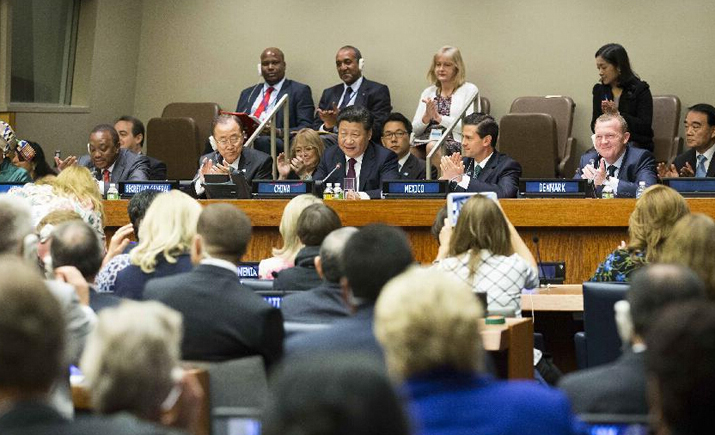 Fourth, Xi called for fostering "a global environment favorable for women's development." "We must stand firmly for peace, development and win-win cooperation, cherish peace dearly and uphold it so that every woman and child will enjoy the sunshine of happiness and tranquility," he said. The president called on women's organizations in different countries to strengthen interactions, urging developed countries to scale up financial and technological assistance to developing countries and narrow the development gap among women in different countries. "As the Chinese people pursue a happy life, every Chinese woman has the opportunities to excel in life and make their dream come true," Xi said, vowing to do more to enhance gender equality as a basic state policy, give play to women's important role as "half of the sky" and support them in realizing their own dreams and aspirations in both career and life. China will, in the coming five years, help other developing countries build 100 "health projects for women and children," send teams of medical experts to provide services, and implement 100 "happy campus projects" to finance the schooling of poor girls and raise girls' school enrollment rate, said the president. China will also host 30,000 women from developing countries for training programs in China and provide 100,000 skills training opportunities in local communities of other developing countries, Xi said. Ban thanked the Chinese Government for initiating the meeting, which will be a milestone in the cause of international women's development. He called on governments of all states to take measures to ensure gender equality while implementing the post-2015 development agenda. Around 100 representatives, including 80 heads of state and government, attended the Global Leaders' Meeting, where they exchanged views on the issue of global women's development, reaffirming that gender equality is a precondition for social development. They said the international community should maintain peace to prevent harms on women brought by wars, calling on all countries to make unremitting efforts to ensure safety and dignity of all women, protect women from violence, ensure their rights of education and working, and realize comprehensive and equal participation of women in social and economic activities at an early date.